The IRC protocol doesn't define a specific character-set that should be used, so over the years, lots of different character-sets have become popular on IRC. This presents a big problem, because, if you're using a different character-set than someone else on IRC, you'll receive their text as garbage. In western countries, we generally use CP1252 (Windows Latin), this is the most popular character-set on IRC. 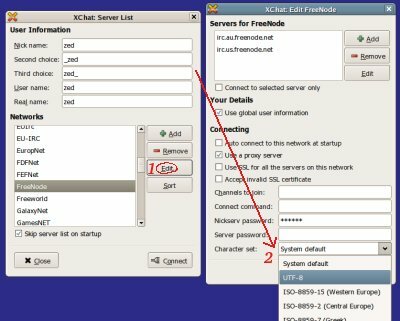 By default, XChat uses your system's character-set. In the past this was often ISO-8859-15, but recently, Linux distributions have been switching to Unicode (UTF-8). In a perfect world, everyone would use Unicode and there wouldn't be any internationalization problems, but convincing IRC users to change isn't easy! The great thing about Unicode is that it's got characters for every language. Latin/Unicode hyrbid encoding may now be the best choice. 1) In the Server List GUI, you may select a different character-set to use for each IRC network. See the combo box "Character Set:" and make a selection. If the character-set you're after isn't listed, you may enter it manually. The conversions are performed by ICONV, which knows hundreds of different character-sets. On a UNIX system you can type iconv --list in a terminal for a complete list. XChat will now use ISO-8859-15 for IRC traffic (if all Networks are set to "System Default", like in the picture above). /charset IRC. Below is a description of how it works. CP1252, even by older XChat versions. 1. XChat 2.6.8+ set to "IRC". OR 2. Older XChat set to "UTF-8", but not Latin-1/ISO-8859-1(5)/CP1252. OR 3. Newer mIRC set to "UTF-8". OR 4. Any UTF-8 enabled client. non-ASCII from mIRC users (non-UTF-8) and other users sending you UTF-8.